Photos of the owners with George Pataki and Rudy Giuliani hang behind the front desk. 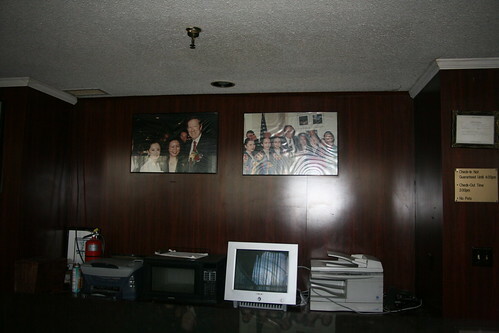 Also a microwave is stationed behind the front desk, however, this was likely an addition after the hotel closed, since as I mentioned this area became a sort of base for post-abandonment operations. The electricity was on, even though the lights were switched off at the breaker, so when they come to hang out in this area, they likely use the microwave to heat up snacks.